Ok! Today is the day that I am participating in a much anticipated design event, The One Room Challenge. I am excited and nervous..well more nervous to be honest. This is not only a new event but a new blog.” What am I thinking?” is constantly going through my head. So lets be real, this is not going to be one of the more fancy and polished blog posts out there but I am going to share with you this remodel journey just like I share my painting videos..with all the flaws, mistakes and the finale that usually shocks me! So on to this renovation of my kitchen/dining space. To begin with it has a lot of challenges with out the added title of the ORC. The actual kitchen footprint is 10x12 and there is a casual dining area in the adjacent space. The kitchen is separated by a wall to the private dining room that is separated by another wall that is made of glass for the Atrium? Solarium? I am not sure what you call that room but I definitely know that it is the final resting place for all my plants. Even though it has a skylight it is too small and too high up to matter. That room is empty most of the time and was just a space with windows on each side to view all the other rooms. A giant fishbowl room with no water or fish. Here is a peak into the before pictures that were taken right before we bought the house 3 years ago. What you do not see in these Professional Real Estate photos is the three different types of flooring that intersects together. The brick tile in the solarium, the clearance aisle tile in the kitchen/eating area and wood laminate in the dining room. If you look up, you will notice the A frame 12 ft ceiling in the eating area, the lowest ceiling in the house at 8 ft high in the kitchen, the 9 ft coved ceiling in the formal dining and the 15 ft skylight in the solarium. Don’t get me wrong I love my home…but the small kitchen did not make sense to the 3100 sq ft one level Texas design. As they say here in these parts “Everything is bigger in Texas’ so we need to get ‘er done. The design plan is to extend the kitchen and the only way to do that is to knock down walls, three to be exact. The formal dining room wall that is sharing the wall to the kitchen and the 2 glass walls from the Solarium so that this space will go from 10x12 to 21x23 WOW!! My husband was skilled as a carpenter at an early age and was a journeyman carpenter for many years with vast knowledge in full scale construction. Now he is a Project Engineer for a General Contractor who’s main client is the DFW Airport specializing in Jet Bridges to full scale Airport remodel. So to say I have confidence in his abilities is an understatement, he is an extremely talented man for sure. I also have remodeled and re-designed 6 homes that have been sold either in 1 day or less than a week. One of them being a house sold in the Housing Foreclosure Crisis of 2008 and not at a loss. That fact has built up my confidence to know that my ideas are not just unique and exclusive to me but others have fallen in love and invested in them as well. With all that being said, this project is HUGE and a challenge to make these 4 separate rooms into one with all their differences flow into one design. That brings me to the one reason I was fine with the broken tiles and missing grout and boxy floor plan… my dining room walls. 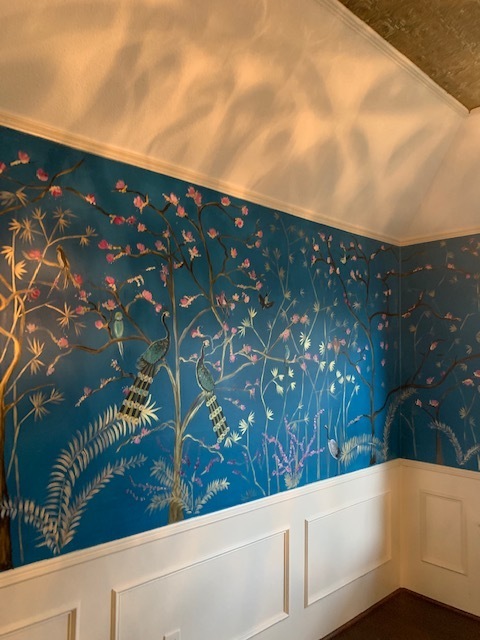 I painted a Chinoiserie hand painted wallpaper on three walls in one day. I painted them Live on Instagram and took video of the unplanned without a sketch walls. I went solely off my longtime deep love of this 18th Century motif. What I loved the most about them was the reaction when people would walk into the room with big heart eyes and without having to ask I would announce “Please touch them, that’s what they are there for.” Then immediately they run their hands over the walls to feel the textured paint of the birds. That’s pure “design joy” right there. But the walls must come down. Vintage, resale and flea market purchases have gone beyond a necessity for me. The thrill of finding an item of clothing, piece of furniture or even a home that has years of memories before me is a true delight. This space will be a challenge to many degrees as I realize my pocket book and my time for many of these purchases will be ‘Never Used” items. They will be new. Hey, I Iove new as well but the age of a home that has years of running feet and furniture slid over them is swoon worthy…..WAIT! Hold up! Make the needle ripping off a vinyl record noise….my current used floors do not apply…SO I am willing to shop online and in stores to pick out new floors and cabinets to love first. I will be searching high and low for all the kitchen jewelry vintage or new.The lighting, the cabinet pulls and a brand new handpainted wall. My front room with its 12 ft high couffered ceilings and huge Vintage Chandelier taken from the original Neiman Marcus here in Dallas was designed with the inspiration -French Bohemian Hotel Lobby. So to flow with that idea I am looking at French Art Deco as inspiration. I originally thought of the beautiful black and white harlequin tile floors that I have often admired in Historic Hotels. When thinking of how open and spacious this space will be and having a view from two main living areas I just felt it would be too busy. Could marble like tiles give the impact and drama at the same time be easy on the eyes? We will see. I leave you with some of the mood board photos and will let you know how on earth we are going to be able to transform those ceilings to make sense. Its either going to be genius or..well there is no or….we live with it! Coming up with an Oceans 11 heist to get this mirror MUST HAVE! Looking for Vintage Lighting and love these Skyscaper Deco Milk Glass Pendants for the island but they are thousands for 3. Keep looking or new heist.